In his At The Movies Roger gave this movie a Thumbs Down saying "it was a little too cute for its own good." He also said the style of the movie worked in Domino, but didn't work here(?). 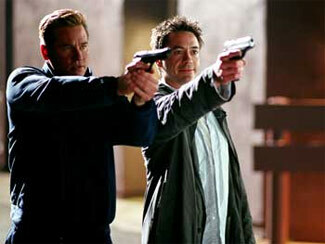 In his written review he said "Kiss Kiss, Bang Bang contains a lot of comedy and invention, but doesn't much benefit from its clever style. The characters and plot are so promising that maybe Black should have backed off and told the story deadpan, instead of mugging so shamelessly for laughs." 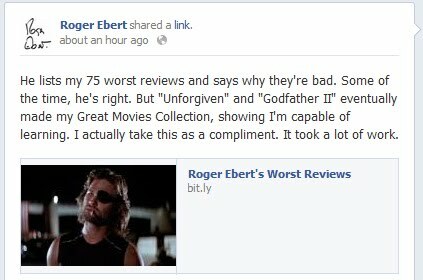 Once again, Roger doesn't like a movie that has more style than substance. He just doesn't seem to get it that sometimes people can sit back and just enjoy what they are watching without having to be carried along by a structured narrative. He closes his review by saying "But did I need to see it twice? Not really. Do you need to see it once? Not exactly." Wow! I'm really stunned by this one. This was one of my favorite movies of the first decade of the 2000's. I loved Val Kilmer's self-assured, openly gay character Gay Perry. I thought the movie was fresh, clever, funny and extremely entertaining. It has a 7.9 rating on IMDB and an 83% rating on Rotten Tomatoes, so I am not alone.